Rebecca Johnson grew up in an art centric family in rural Hopewell, New Jersey. Her parents were designers, artists and art educators. Life is art was the family credo. This philosophy enriched and continues to inform Rebecca’s art and career. As a young artist Rebecca embraced the path of the successful professional. She received her BFA from Tyler School of Art and her MFA from the Pennsylvania Academy of the Fine Arts. 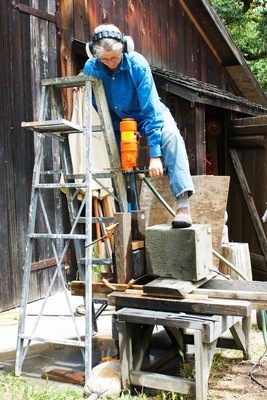 She studied bronze casting at the Johnson Atelier in New Jersey and stone carving in quarries in Vermont. Grants, fellowships, shows in galleries and museums, commissions, critical acclaim and teaching positions at Dartmouth and Kenyon Colleges distinguished her career. A fulcrum of change occurred when The British American Arts Council awarded her a three-month fellowship to work in Northwest Wales. In this land of stonewalls, craggy mountains, wild coast and rich folkloric history Rebecca’s ideas gestated. Time and solitude created space for her to thoroughly see and imbibe the light, color and form of the land. Her exterior and interior visions integrated and enhanced each other. Rebecca discovered a new degree of courage and conviction to follow her work to its true ultimate power, rural nature and a poetic vision. Rebecca returned home to Philadelphia where her next project was the transformation of a cavernous train depot into a showroom for Material Culture, in Philadelphia. The completion of rich earth tone and midnight blue murals, one hundred feet long and thirty feet high, reassured her a personal metamorphosis was also possible. She packed her tools, cats and dog and headed west. Rebecca now lives and works in Northern California, Mendocino County, a place of raw elemental forces. 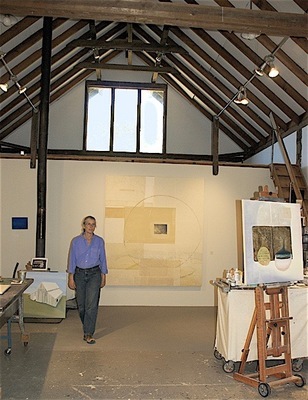 Her studio is in the Anderson Valley. Inside a large renovated barn she creates paintings. The doors of the studio open to a hillside meadow filled with her stone sculpture. The calm beauty of this rural place resonates from her work.